Our springtime bounty is bursting with the most fruitful flowers around! 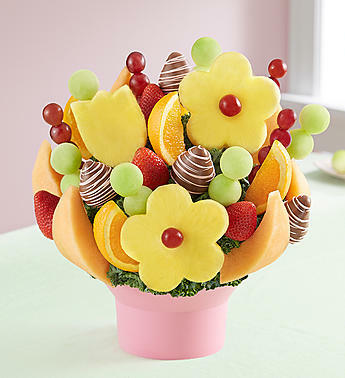 Pineapple daisies & tulips put an extra tasty twist on a mix of plump, dipped berries, juicy melon, oranges and grapes. It’s all served up in a pretty pink bowl for a sensational (and shareable) seasonal treat that’s anything but garden variety.